Every day, sick and injured dogs and cats in our community are suffering and at risk, just looking for a second chance. We at PAWS Chicago are able to rescue so many from an unthinkable fate because of our advanced shelter medicine program, where we are able to take pets in need and give them the treatment, surgeries, and medicine they need to heal and find loving new homes. But the advanced medical care that we provide means that our veterinary team is in constant need of lifesaving equipment, medicine and supplies to continue to save more lives. You can help. Here are several of our most used and most needed items that enable us to save cats and dogs like Kal and Flora, whose stories are told below. Warming pad used during recovery from anesthesia or intensive care these pads keep dogs and cats at safe and comfortable temperatures during prolonged medical procedures. Doxycycline a broad-spectrum antibiotic used to treat many different bacterial infections in dogs and cats including upper-respiratory infections—the most common illness for homeless pets. IV pump enables our veterinarians to set a specific rate at which fluids with medications can be administered intravenously to a sick dog or cat. Syringe pump allows veterinarians to give dogs or cats continual dosages of medications at a highly accurate and adjustable rate to aid in their recovery. Bair hugger a device that forces warm air into a blanket that is used during medical and dental procedures to keep an animal and any fluids that are being infused into the dog or cat warm while they are asleep. Dental X-Ray a special x-Ray machine specifically designed to X-ray the mouths of dogs and cats and can help our veterinarians diagnose problems that are not otherwise visible. 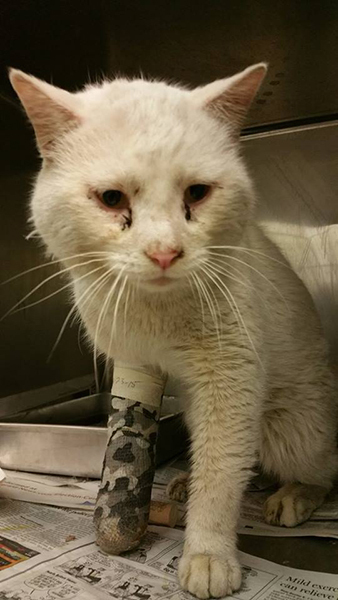 When we met Kal, he was suffering from calici, a severe upper respiratory, and a broken paw. 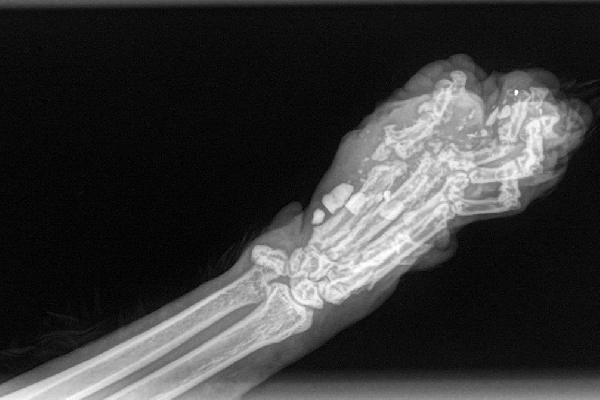 At just five-years-old, some thing or someone smashed his foot before he found comfort at PAWS. Today, Kal is on the mend. His calici is cured. His paw is healing nicely and he has a long, healthy life ahead of him. Kal would not be alive today if it were not for our dedicated veterinarians and the medicines and equipment they have at their disposal to treat animals in distress. 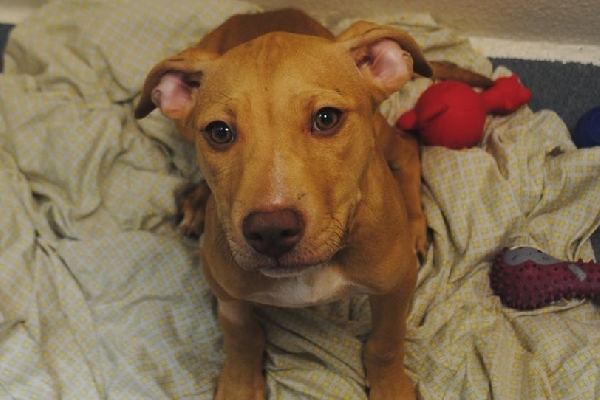 When we met Flora, she was on the euthanasia list at the city pound. 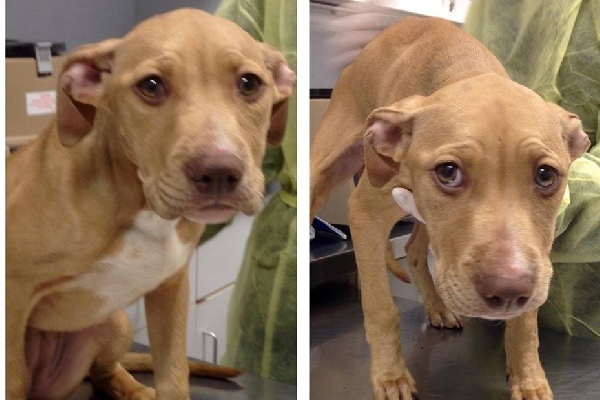 This sweet, affectionate five-month-old puppy was diagnosed with parvo and we could not turn our back on her. 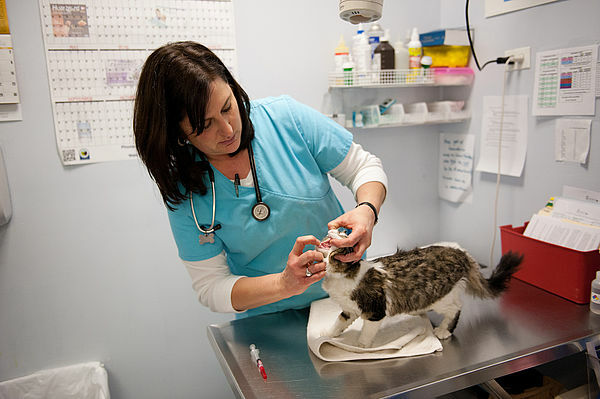 At PAWS Chicago, our veterinarians quickly isolated her and began treatment with a variety of IV medications. Because of our leading shelter medicine program, we have a great save rate when treating the dreaded parvovirus and Flora will be among the lucky survivors. She owes her life to generous supporters who arm our veterinarians with the medication and IV pumps that saved her. As we face an ever-growing number of sick and injured homeless pets, our need for the items on our veterinarian’s Wish List grows. Please help us continue to provide world-class care to homeless cats and dogs in need. A gift in any amount will make a difference in the lives of homeless cats and dogs. Donate: Help purchase items from our Veterinarian Wish List and provide the medication, equipment and support we need to treat sick and injured pets. Give Monthly: Join PAWS Chicago’s Lifeline Monthly Giving Program to help us save more homeless animals. Foster: Foster an animal in need and help more animals make the journey to a loving home. Volunteer: Join our network of volunteers and continue to save lives and expand our life-saving services.